Thankfully, they only eat two meals a day: in the morning to break the fast and in the evening, where they share their ration with friends. So, what are they eating? Amongst the group of seven, they have a small selection of spices for flavouring as these last for years if they are kept dry. They include salt, pepper, thyme, rosemary and dill. The mushrooms they’re finding on the way are also adding flavour. Other items in their packs would include loose tea, honey, garlic clove, onions and potatoes. McGuigan has hard bread. I can make a tasty soup in about an hour with 3 garlic cloves, 1 onion, potatoes, 2 carrots, salt and dill. 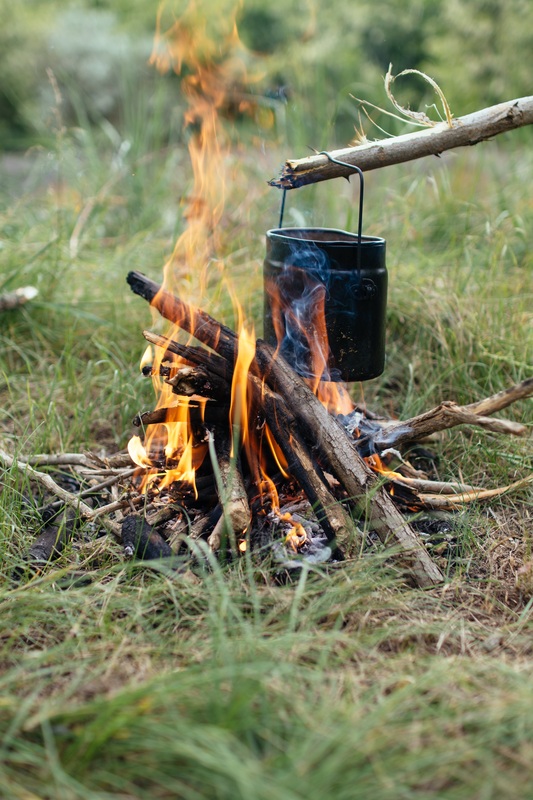 If I had a piece of meat, I’d cut it up, cook it for 20 minutes in the pot with lard, throw in the rest of the ingredients with water and let it simmer for about an hour while I got my bedroll ready, gathered more firewood and played a game of cards. It’s not fancy, but it’s tasty and fills the belly. A quick check on the Internet for food that has long-storage life gives me suggestions such as honey, lentils, white rice, hardtack (flour and water ‘bread’ used long ago), dry beans, maple syrup, pasta, rolled oats and powdered milk. In the Land of Ath-o’Lea, there is no powdered milk, pasta (including mac and cheese) or rice, so those are out of the question. Beans take too long to cook, so they’d never be made while travelling. Lentils take under an hour to cook, so they could be carried by the group. Although I love oatmeal, I hadn’t thought of oats, so I’ll use them. Isla likes raisins, so she can add a few of those to her bowl. Ten days into the journey, McGuigan pulled out the last one of his mint jelly candy he had bought at Inglenook. It had survived the journey and he enjoyed all the sweetness though Isla tried to talk him into sharing that lone candy. Their friend Coraline had given each of them a small sack containing scroggin, a mixture of dried fruit and nuts. They eat these sparingly with the hope they’ll last until they reach Allestree. Obviously, they’re not going to indulge in a full bowl of snacks. They eat one or a small handful and put the rest away for later. My fantasy world is set in a world similar to that in mediaeval times, when life was hard but basic. Their food was also simple. One source of information I use to gather information on food from that time is the YouTube channel Modern History TV, a show hosted by Jason Kingsley. In Part 13: What Did Peasants Eat in Medieval Times?, Jason and his guest, food historian, Chris Carr discuss the food from that period. From this, we learn peasants ate well, better than the wealthy because it was whole food, whereas kings ate more processed foods. The peasants’ mid-day meal included salmon because, well, salmon was free food caught, so it wasn’t valued. I’ll have to treat my characters to salmon steak when they arrive at an inn. After all, it’s cheap, unlike when I buy it at the store in my world. Some great research. That’s what makes creating a story fun. Thanks, Darlene. I agree. Sometimes I get lost in the research. I’m loving that new channel I found (Modern History TV). Lots of good information, and the host is a wonderful character.